(From left to right): John Muckridge (Rescue Mission of the Mahoning Valley), Eric Carlson (“Joe” Dickey Electric), Jim Burgham (IBEW Local 64), Tom Lipka (Mahoning Valley NECA) and Bill Booth (IBEW Local 64) smile during a check presentation this week. 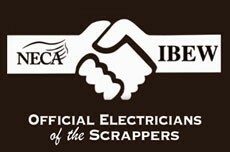 The Move Our Mission campaign is that much closer to breaking ground due in part to a $5,000 donation from NECA-IBEW Electricians. 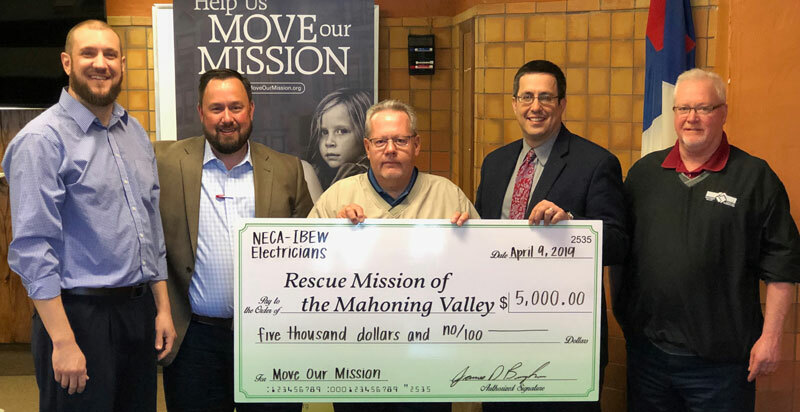 Representatives from the Mahoning Valley NECA contractors and IBEW Local 64 electricians visited the Rescue Mission of the Mahoning Valley this week to present their check. The electrical room in the new mission building will be named in honor of the group. The Rescue Mission is looking to build a $4.95 million new facility down the street from its existing building on Martin Luther King Jr. Boulevard to better meet the needs of the people it serves. Its years-long fundraising campaign is less than $500,000 from reaching its target. To contribute to the campaign or learn more, visit MoveOurMission.org.